"Yoga Art Form Personal Checks" product is already in your cart. The Yoga Art Form Personal Checks will bring you an expression of spirituality mixed with beautiful abstract art. The chakras are subtly picked up through the center of the body in each image as the figure stretches into a yoga pose. The ohm yin yang symbols appear in the artwork perfectly to bring in that mystical element to the design. Enjoy using your colorful artistic checks featuring the elements of Yoga healing and enlightenment with each financial transaction you make. 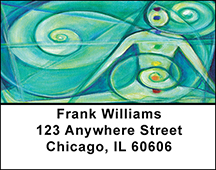 Consider matching Yoga Art Form Address Labels and a coordinating Checkbook Cover and save on your entire order today.